The 100th’s colors (battalion flag) show the reason why the men were fighting for their country and indicate the origins of the battalion. Larry Sakoda of D Company designed the eagle holding a banner in its beak with the 100th’s motto, “Remember Pearl Harbor,” a reminder of the devastating attack on their homeland and the event that brought the United States into the war. Keiichi Kimura of Headquarters designed the lower section with the battalion’s name. In the middle of the eagle is the battalion’s insignia with its references to their Hawaii home. Three insignia are of major importance to the battalion. The Distinguished Unit Insignia (DUI) is a proud symbol of the unit’s history and identity. The Shoulder Sleeve Insignia of the 34th Infantry Division and the 442nd Regimental Combat Team mark important milestones in the 100th’s history. The leaf, helmet and motto on the DUI all have specific references to Hawaii. The leaf is that of an ape plant, a species of taro, which symbolizes protection in Hawaiian culture. The helmet, crested and adorned with yellow feathers, is that of a native Hawaiian chieftain, symbolizing strength and valor. Infantry colors of blue and white are the background colors. Approved by the men at Camp McCoy in 1942, the initial design was rejected by the U.S. Army Institute of Heraldry and replaced with a red dagger and the motto, “Be of Good Cheer.” Colonel Turner fought successfully to preserve the battalion’s original choice. 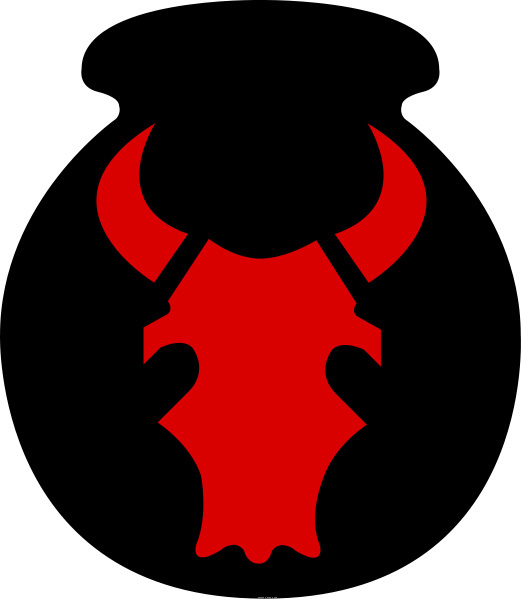 The 34th Infantry Division’s Shoulder Sleeve Insignia features a red steer skull superimposed over a black, Mexican water jug called an olla. Designed in 1917 during World War I, the insignia evokes the 34th’s training grounds at Camp Cody, New Mexico. As the first U. S. Division deployed to Europe in World War II, the 34th received its nickname from the German troops they encountered, who called the division, “Red Devils” and “Red Bulls.” Related to the Distinctive Unit Insignia, the Shoulder Sleeve Insignia, or “Combat Patch,” is worn on the shoulder of a soldier’s uniform and used for battlefield and command identification. In 1943, after little more than a month spent in combat attached to the 34th, the men of the 100th were presented with the Shoulder Sleeve Insignia of the Red Bulls. General Charles Ryder, the 34th Division commander, personally distributed the patches as a show of his respect and high regard for the men. 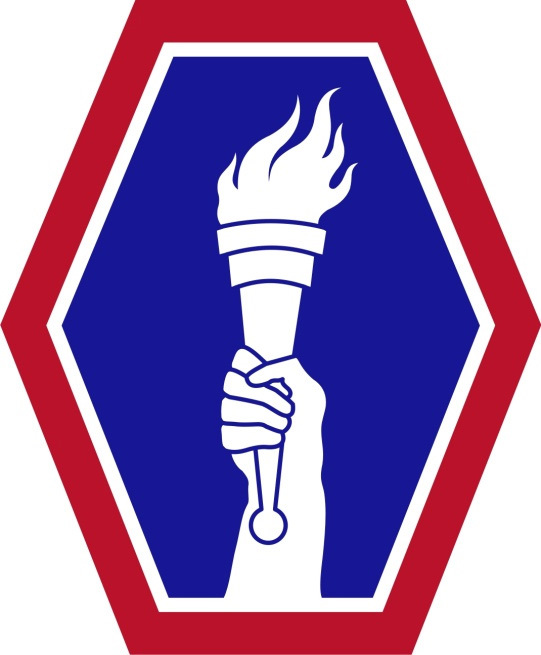 The Shoulder Sleeve Insignia for the 442nd Regimental Combat Team features a white torch of liberty, symbolizing light and guidance, upon a blue background. Red and white borders complete a full set of red, white, and blue national colors. Like the 100th Infantry Battalion, the 442nd RCT was initially assigned an unsatisfying insignia. Approved on July 31, 1943, the original patch was centered on a yellow arm bearing a sword to symbolize the Japanese-American soldiers. This design was met with protest by the members of the combat team. 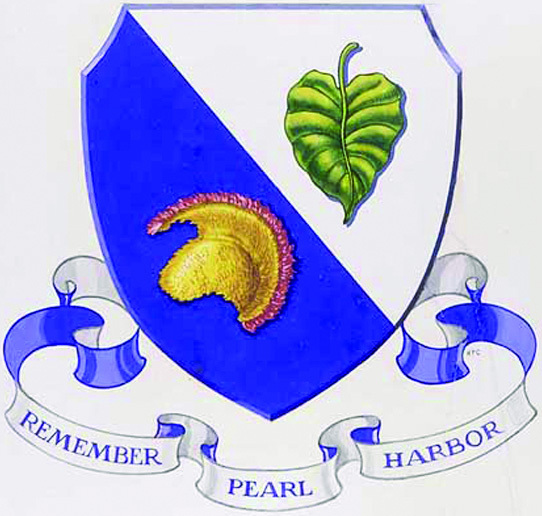 Mitch Miyamoto of 3rd Battalion created a new design, which was approved for use on December 16, 1943. After severe losses in January 1944 at Monte Cassino, the 100th was reinforced by members of the 442nd. 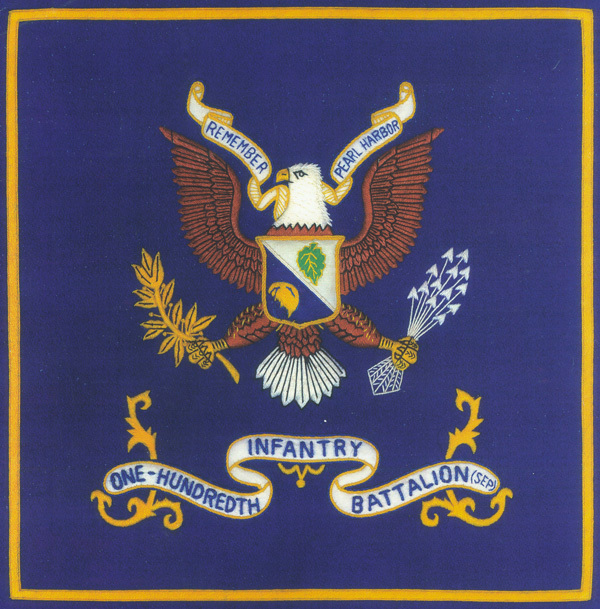 The following June, the 100th was attached to the 442nd, functioning as their 1st Battalion but retaining the name of the 100th Infantry Battalion due to their outstanding combat record.